Cocktail Audio X10 can stream music and rip your CDs | What Hi-Fi? 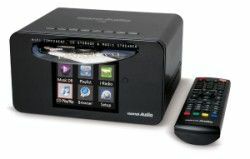 Cocktail Audio has announced the X10, a CD player, music storage device, internet radio and more. Cramming plenty in to a relatively compact unit, the X10 combines the functions of network audio players with an integrated hard disk and CD-ripping drive. Available in 500GB, 1TB and 2TB incarnations, the X10 can rip music in MP3, OGG, FLAC or WAV formats, straight to the hard disk. There's built-in amplification, so connect to a pair of speakers and you're in business. You can make a wired connection - or wireless, with the optional dongle - to your network in order to stream music from other networked sources, or add music from other sources to the X10's hard disk. There's access to internet radio too, with a colour LCD promising to make navigating the wealth of stations easier than other devices. The unit can also be controlled via the EyeconnTroller app, available free for iOS and Android devices. There are analogue, digital optical and headphone outputs, plus aux and USB inputs. Available now from £349 (500GB), we'll hope to bring you a review of the Cocktail Audio X10 soon.